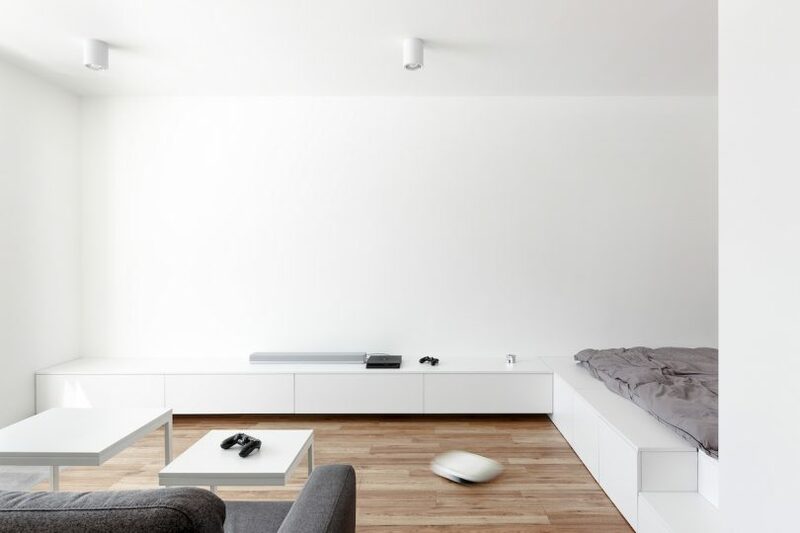 Menchuks Apartment is a minimalist space located in Lviv, Ukraine, designed by Hrystia Koliasa. The space was organized to maximize the client’s main living functions, thus utilizing built-in storage and a custom made bed frame that would serve as the foundation for the internal programs. The designer wanted the interior to have an entirely white palette in order for smaller details to come into focus. In addition, flat surfaces were used throughout the space in order to make daily routines, such as cleaning, faster and easier. A partition separating the bedroom from the entrance hallway is also used as a wardrobe, accessible from either side. The bed is sunken into a platform, which features a small step to delineate between the living room and bedroom.